Famous Florence’s Piazza della Signoria will soon be a space where a timeless Renaissance artworks and a piece of one of the leading contemporary artists will stand side by side. Michelangelo and Koons, can you imagine? 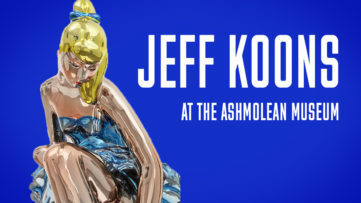 It might be difficult to imagine mentioning Jeff Koons and Florence in one sentence (Florence is not known for contemporary art galleries). 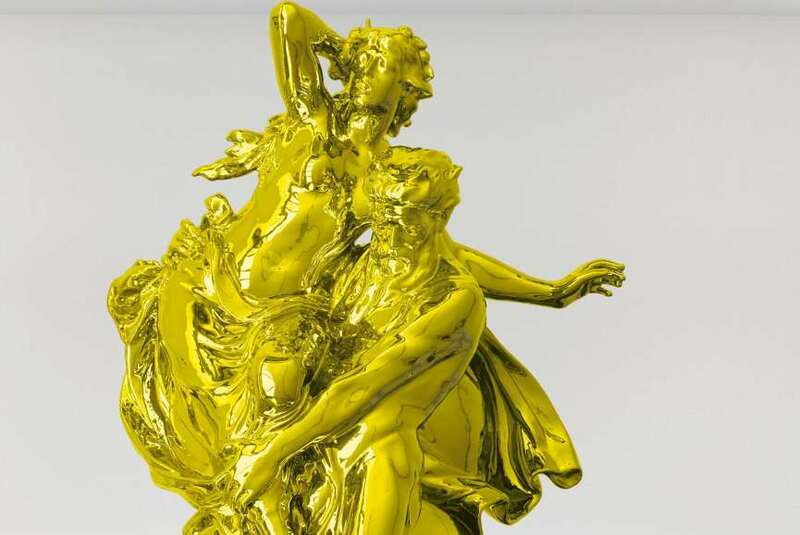 However, Koons, as one of the world’s leading artists and fine art collectors, is going to attend the opening of the Biennale Internazionale dell’Antiquariato, and on this occasion, the artist’s statue of Pluto and Proserpina will be placed on Piazza della Signoria. 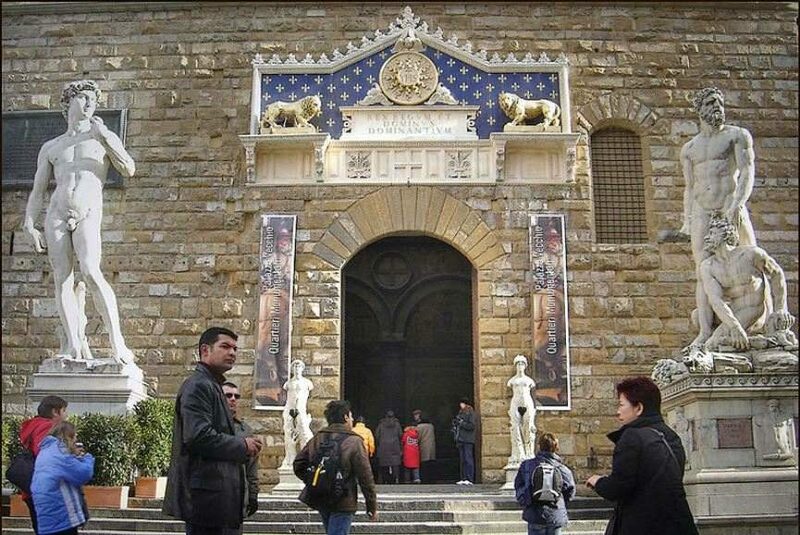 Famous Renaissance sculptures in front of the Palazzo Vecchio (including the replica of Michelangelo’s David) will have a shiny and monumental neighbor. The sculpture by Jeff Koons will be placed in one of the Florence’s main piazzas, just a day before the opening of the 29th edition of the Biennale Internazionale dell’Antiquariato. 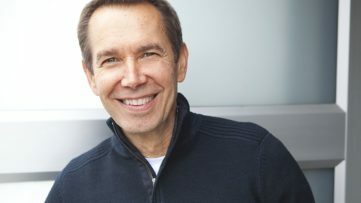 As a guest of honor, Jeff Koons will attend the opening, while his well-known sculpture Pluto and Proserpina (2010-2013) will stand in front of the Florence’s town hall and civic museum – Palazzo Vecchio. This monumental work, more than three meters (11ft) high was made in gold-colored stainless steel, and it will be placed next to Michelangelo’s replica of David from September 25 until December 28, 2015. The presentation is organized by the Mus.e association for Florence’s civic museums, while the whole project is initiated by Fabrizio Moretti, the Old Master dealer and director of the city’s art and antiques fair – the Biennale Internazionale dell’Antiquariato. The whole presentation is funded by Moretti Fine Art, David Zwirner and the Florence Chamber of Commerce. 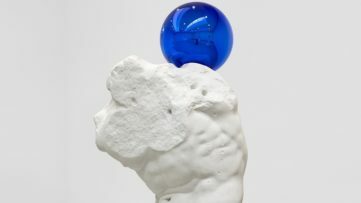 Additionally, Koons’s Gazing Ball (Barberini Faun), from his series of plaster casts of Greco-Roman sculptures, will be presented in the Palazzo Vecchio, in the Hall of Lilies, where Donatello’s original bronze Judith and Holofernes is on permanent display. Florence and Contemporary Art – Koons’ Presentation Just a Beginning? We wouldn’t make a mistake if we say that Florence is one of the places where the modern art was born. However, this beautiful Italian city is not among top spots of the global contemporary art scene. In order to promote the city’s rich history and culture, the Galleria dell’Accademia (which houses the original David) has announced an exhibition that will pair Michelangelo and Old Masters with pieces by ten contemporary artists, such as Koons, Yayoi Kusama, Gerhard Richter and Marina Abramovic. The opening is scheduled for June 2016. Jeff Koons’ oeuvre includes several great pieces inspired by ancient and renaissance art (Pluto and Proserpina is only one of them). 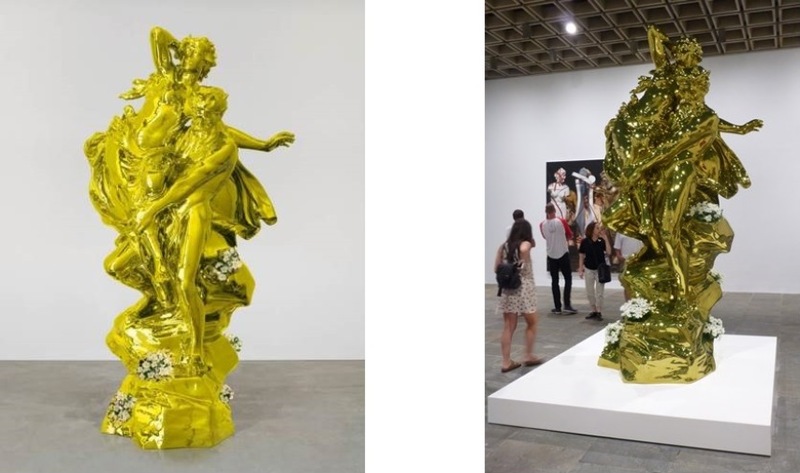 We will see if this planned exhibition is going to present Koons’ works inspired by the Renaissance (from Antiquity series), or some other pieces from his well-known series (such as Celebration). We would like to hear your opinion? Share them with us on our Facebook Page! For the latest news from the world of contemporary art, sign up for My Widewalls for free!